Meet Julia, a business savvy CORE40 client who works for a fashion tech company in San Francisco. After regularly attending other fitness classes in the Bay Area, Julia heard about the intense CORE40 workout from a few fitness birdies. She loves a good challenge, so she decided to check out the studio her friends were raving about. After taking her first class with Janae in Nob Hill 6 months ago, she was eager to master the challenging full body workout. 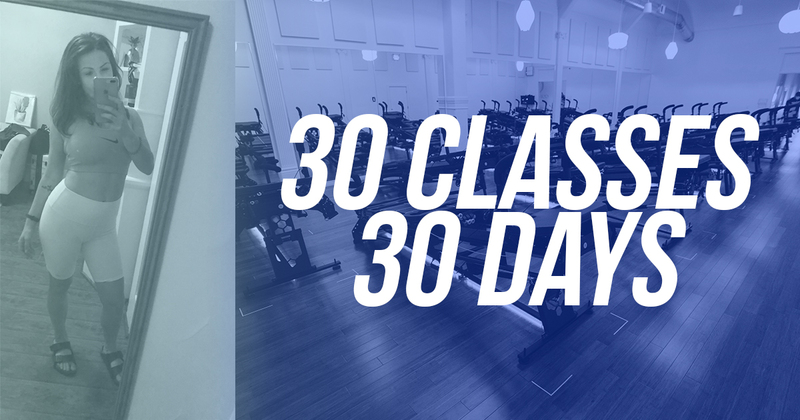 Julia decided to hold herself accountable by completing 30 classes in 30 days. She wanted to be good at the workout, and, like most things in life, she knew she needed to commit to get there. She loved the method and machine, because she couldn’t cut corners and it was a guaranteed great workout in every class. After 30 days, she felt stronger than ever before on the inside and noticed her abs were more visible on the outside. Julia works in sales strategy and feels listening is as important as talking. After 30 days of CORE40 classes, she encourages all newcomers to be patient with not knowing all the names of the moves, because after about a week, all the listening starts to make sense, and every workout is a great one. Her philosophy on life and in fitness is to work hard and get the most enjoyment possible out of the human experience. At CORE40, we wholeheartedly agree with Julia’s perspective. So, whether you’re taking 30 classes in 30 days, or the recommended 3 classes a week, we encourage you to work hard and approach the method with a commitment to GROWTH, because your strongest self is right there waiting on the other side.